Argyle Feed Store has Timothy Orchard Hay available from Colorado. Come by the store and pick up our quality hay bales from this year’s crop. Contact the store for pricing and delivery. Timothy Hay’s high fiber content and low protein levels make this the go-to hay source for many livestock owners. Be sure to balance your horse and cow’s nutritional needs with supplemental feeds that will provide the protein it needs. Store your hay in an enclosed space like a barn or shed to protect it from elements. Also, watch the moisture levels so it doesn’t get mold and attract parasites. 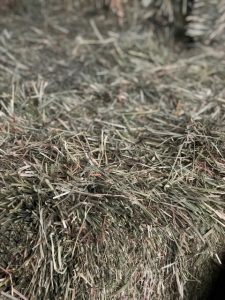 Feeding moldy hay can cause serious intestinal damage to your livestock. This entry was posted on Wednesday, July 25th, 2018 at 7:58 pm	and is filed under Cattle, Horse, News & Updates. You can follow any responses to this entry through the RSS 2.0 feed. Both comments and pings are currently closed.